Need a low cost note book PC? 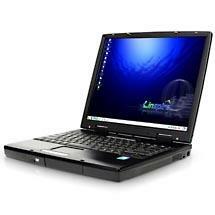 Then set your eyes on the Balance 14.1" Laptop, 1.0 GHz VIA C3 Processor From Walmart.com for only $ 498. Thats right a modern note book for under $500. While it won't be a high-performance gamer's hot rod, you can do word processing, Bloging and e-mail. You can burn or rip Music. For more taxing tasks, you will more than likely need to get more memory. 256MB and 512MB SODIMMs are not very expensive, so I recommend getting one when you can. Installing a new memory chip is not very difficult on this computer. -All-in-one digital photo manager, featuring tools to import, organize, edit, crop, enhance, and share digital photos. Hundreds of digital cameras supported. Even use your photos as a screensaver and make video CDs! -Complete music management with Lsongs to import, organize, play and burn CDs of your favorite music Networking PCs and Printers: Share files and printers between Linspire OS and Microsoft Windows systems Plug-n-Play peripheral support. Great price for people who just need a laptop for basic functions (i.e. internet, word processing, email) "Cant Beat The Price"